Vallisneria genus includes only true aquatic plants (hydrophytes), which are ideally adapted for living in water. It got its name in honor of Italian naturalist Antonio Vallisneri. The plant is spread in freshwater basins of tropics and subtropics of Western and Eastern hemispheres and some species have expanded to moderate climate area. In the wild Vallisneria species grow in freshwater ponds with lentic and lotic water about 1 m deep under water and form thick vegetation. Vallisneria genus encloses many various plants of this kind growing all around the globe. Some of them successfully grow in tanks. We’ll describe them in details below. Unfortunately, their commercial names don’t coincide with scientific ones and quite often one and the same plant is sold labeled with completely different names. Besides, Vallisneria appearance depends on its growing conditions and for this reason its appearance may vary greatly. 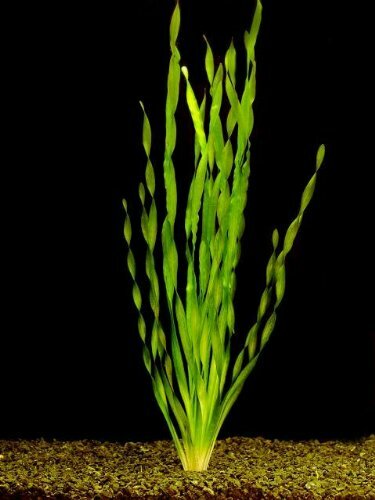 In general, Vallisneria is a universal, easy to cultivate, rather undemanding plant, taking care about which will hardly ever cause any trouble even among beginner aquarists. The plant easily stands quite a wide range of tank conditions and temperature variations from 16 to 30 С. It doesn’t require special fertilizers, since naturally silted substrate is enough for it. After replanting Vallisneria into a new tank, give it some time for adaptation. It stops growing and propagating. However, 1-2 months later the plant starts growing fast. It propagates by growing runners with a bud at the end of each and a new plant quickly develops from it. Vallisneria spiralis also known as straight vallisneria, tape grass, or eel grass. It is a common aquarium plant that prefers good light and a nutrient rich substrate. In the wild, it can be found in tropical and sub-tropical regions worldwide. Vallisneria will do best in rich nutrient substrate and medium to high light. 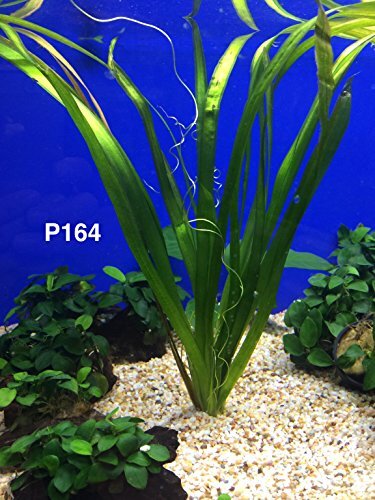 Provided with favorable conditions Vallisneria propagates very fast and in a short period of time it can take over the whole tank. Vallisneria species are perfect both for nano tanks (about 15-20 cm or 6-8 inches high) and for rather spacious ones. These plants look especially appealing in extra high tanks. The plants are put in a group in the background or in the middle, or in the corner of a tank as well. The wider and longer the tank is, the more comfortable it is for the plant. At that the height of the tank isn’t a constraining factor, since light absorbing property of water doesn’t have high impact on Vallisneria species growth. Like most of higher plants, these species prefer bright light, though in case of lack of light, they won’t die and continue developing, but at a slower pace. 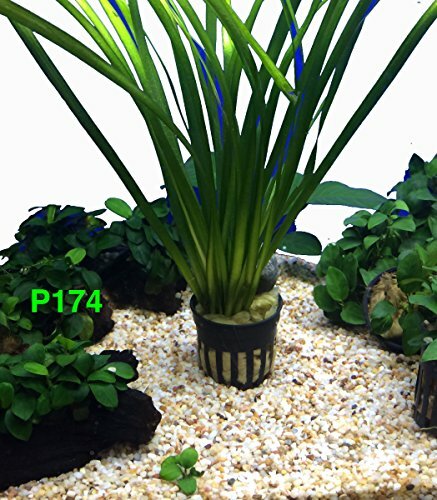 If you want to select light intensity particularly for Vallisneria species, it’s better to do it in an experimental way – from maximal possible lighting level for the current tank (it is about lamps wattage and duration of their working time) to the minimal lighting level, when the plants stop growing completely. Most of Vallisneria species including tropical ones prefer water of medium hardness with neutral or slightly acidic pH. In the wild these plants grow in a very much wider range of hydrochemical parameters. Only very acidic (pH less than 5) and very soft water (dGH less than 4°) isn’t good for the plant, since in such medium Vallisneria quickly dies because kalium in its tissues gets dissolved. Type of bottom substrate, its thickness and how silted it is, isn’t important for the plant. As a rule it doesn’t require additional fertilization and natural silting of the substrate has enough nutrients for it. Vallisneria species grow at wide temperature range, that’s why you can grow them both in tropical tanks and those without heating. Lower temperature limit for most Vallisneria plants is 15°С, tropical species are exception in this case. These are most of pygmy species that stop growing when the temperature is just 18-20°С. In general Vallisneria is undemanding and it can be recommended for beginner aquarists. But you shouldn’t cut its leaves, which is often done by beginners. Vallisneria is rather enduring, but after you do this, its leaves start to turn yellow and rot at the point where they were cut. We should mention one more peculiarity of this plant: it reacts adversely to copper excess in water. This chemical element can get into a tank as a component of substances used against algae or shell-fish in a tank. Some of other drugs often contain cupric sulphate, that’s why if you decide to cure your fish in a tank with Vallisneria in it, the latter may die. The plant can also die because of iron oxide (rust) presence in the tank water. Vallisneria propagates very good. You can get over fifty bulbils from one parent plant in a year. These species never have any problems with propagation. The easiest way of propagation in a tank is a vegetative one. Daughter bushes form from runners that grow from the rosette base of the parent plant. New plants are 5-10 cm away from the parent one and once they strike roots, they grow their own runners. As a result you get a whole cascade from large number of young Vallisneria bushes. Vallisneria americana is easy to propagate using runners, which are prolific if the bottom is nutritious. These young plants can be separated from a parent plant once they have 3-4 leaves about 6-8 cm long. But even if you don’t do this, the runner connecting the new and the parent plant will die off itself later. Vallisneria bushes usually don’t require weeding. It is needed only if the latter create shadow for other tank plants. In a tank Vallisneria develops uniformly during the whole year round. It doesn’t have visible dormant period, but the growth rate may vary. At that it is possible, that after relatively long period of active vegetation the plant suddenly stops growing. Such a situation should be considered as a norm, since, as a rule, several weeks later the plant continues growing. From time to time parent plants die, since Vallisneria bush lifespan is about 2-3 years. In general, this loss is almost noteless, since it is more than outweighed by the number of young bushes. Wast majority of tank fishes don’t demonstrate any interest towards Vallisneria leaves, because most representatives of this genus have rather coarse leaves. This is true both for large species of armored catfishes and for herbivorous cichlids. Bottom digging fishes are the only ones who can damage Vallisneria plants, because they easily pull out from the substrate the bushes you have planted. However, ornamental aquarium snails are those who love Vallisneria. They gladly crawl on its leaves without doing any harm to the latter. Besides, thickly growing Vallisneria bushes are a shelter for both fish juveniles and small shrimps. Very often, these bushes are the shelter for the whole generations of the juveniles and shrimps. When speaking about Vallisneria most of aquarium hobby fans mean Vallisneria spiralis (which is also called straight vallisneria, tape grass, or eel grass) with ribbonlike bright green leaves. However, the species got its name not due to its curved leaves, but because of its spiral shaped floral stem. This is the most widespread aquarium plant and definitely the most popular one among Vallisneria species. Vallisneria spiralis is often confused with another species (with nice spiral shaped leaves) – Vallisneria asiatica var. Biwaensis, which grows in tropical Asia. The plant is endemic to lake Biwa in Japan. It grows in shallow waters in well lighted areas. This plant has been known in aquarium hobby since 1991, when Dennerle company first brought it to Germany. This species is distinguished by its unusual curved narrow leaves about 3-5 mm wide and up to 40 cm long. Such an appearance gave the name to the plant – Vallisneria corkscrew. It grows fast, propagates by growing runners which are a tiny copy of the parent plant. This is a relatively new plant in aquarium hobby. It originates from North Australia. In the wild it grows just 15 cm long, which compared to other Vallisneria species isn’t long at all. That’s why the plant got the name ‘nana’. The plant has light green leaves resembling ribbons in their appearance. It grows fast and forms a lot of runners. If you put Vallisneria nana in the background, soon you will get a solid green curtain there. The plant is easy to keep and undemanding in terms of tank conditions. Nevertheless, it is recommended to add liquid fertilizers rich in iron and additionally supply CO2 into the tank. In this case the plant leaves gain saturated emerald green color. This is a large plant with linear leaves of bright or dark green color that grow more than 1 m long. You should keep Vallisneria gigantea in a large sized tank. The plant is comparatively undemanding, but due to its large size it is seldom kept in home aquariums. It grows uniformly the whole year round. The plant is valued by fans of large fishes since it is undemanding, it looks great against their background as well as successfully withstands the fishes attacks. Tank illumination should be rather bright. You should keep in mind that long leaves of this Vallisneria species create shadow for shorter plants that grow below. That’s why except intense overhead lighting you should install additional lateral illumination in the tank.